In 2018, the Migos announced that they would each be releasing a solo project. Quavo went first and released his album “QUAVO HUNCHO”. Next was Takeoff with his album “The Last Rocket”. Quavo’s project was a bit underwhelming and Takeoff’s project showed that he is an underrated member of the group. Now it’s Offset’s turn with his album “FATHER OF 4”. I strongly feel that Offset is the best rapper of the three Migos and I’ve felt this for a while. Takeoff is a close second and Quavo is firmly in last; although he makes up for this with his melodic hooks. Since I already felt this way, it didn’t shock me that Offset’s album was by far the best of the group. His rapping ability makes him the one member of the Migos that I could see potentially having a solo career. This is also why Offset gets called to feature on other projects fairly often. This album was surprising in many ways. Firstly, I was amongst the group of people who wasn’t aware that Offset has four children. Within the first track he opens up about having his first child at age 17. He goes on to name all of his children and speak on his relationships with their mothers. This was subject matter that I didn’t expect from Offset and I was pleasantly surprised he was willing to open up. Two of the features on the album also surprised me: J. Cole and CeeLo Green. Both of them add their unique sounds to this project and help to sonically expand the album beyond the trap sound we are used to from the Migos. Cole spits his special brand of lyrical fire on “How Did I Get Here” and CeeLo adds some amazingly smooth vocals to “North Star”. Also, to no one’s surprise, Cardi B was featured on the song “Clout”, and I can honestly say that she delivers one of my favorite verses on the entire project. This album is full of bangers, as expected, but it also has its fair share of deep content. Critics of today’s rap dislike that many rappers seem to only speak about partying and money while they fail to put out any content of substance. Offset proved to me that he has the ability to switch things up if he wants (keyword: wants). Overall, this album was good and has solidified Offset as my personal favorite member of the Migos. 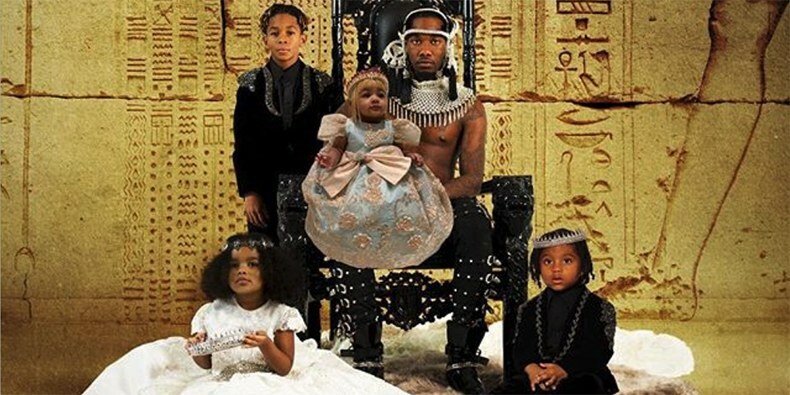 The main negatives are the cover art, which was clearly photoshopped (unfortunately it doesn’t appear that Offset was able to get all of his kids in the same room), and I personally think a couple of songs could’ve been cut (perhaps the song with Gunna). I’m glad the Migos experimented with doing solo art and I’m looking forward to what they create in the future.